OK, it’s more a hymn than a poem as such (whatever that may be), but it is quite lovely, with an interesting use of rhyme. And what a perfect name for someone who wrote hymns! If that happened today we’d think it was an advertising slogan, but this work dates from 1664. The image is rather strange, as Jesus looks a little like a football player who has just scored a goal, or a cricketer who is appealing for a wicket. A tad arrogant? Mary Magdalen looks totally inspired; as you would be, being the first person to see the resurrected Christ. Or in this case the elbow of the resurrected Christ. The first apostle with eyewitness news about to run off and spread the word. Amazing that some churches still don’t have women priests. I think they’d rather that Jesus appeared to a man. Silly mistake for the Son of God, what? I had a quiet Easter and a chocolate Easter. Hope all my readers, whether atheists or religious in some way, also ate their weight in chocolate. I’d hate to be the only fatty. 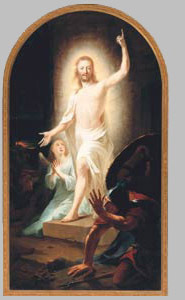 The painting is by Johann Heinrich Tischbein the Elder: Resurrection, 1778. Snatched from the vaults of Wikimedia Commons. My next post will have details of the Canberra and Melbourne launches of The Stars Like Sand. My mother, who passed away peacefully just before Easter, would love this hymn. She truly believed she was going to ‘gladly spend’ all her days in Heaven. Thank you for sharing this poem at such an appropriate time for her, and me. Thank you for sharing that, Norah.